From left to right: Amb. Jimmy Kolker, Peggy Hamburg, Steve Davis, Scott Dowell, Beth Bell, Pamela Collins​. Photo courtesy of Sara Allinder. My latest brief details reflections from this year’s International AIDS Conference in Amsterdam. Many leading figures painted a sobering picture: goals for global HIV/AIDS treatment and prevention are not likely to be attained, funding has declined, high-level political will is lacking, and there is the risk of a resurgent pandemic, all of which makes for considerable discomfort and uncertainty. We are at a turning point in thinking about what comes next in controlling HIV/AIDS in the coming years. On August 6, 2018, the CSIS Commission on Strengthening America’s Health Security hosted a public event in Seattle, Washington, on U.S. leadership in meeting the burgeoning health needs of vulnerable populations living in the midst of conflict and disorder. Commissioner Senator Patty Murray, senior Democratic senator from the state of Washington, gave the keynote address, followed by an expert panel moderated by Commissioner and former U.S. Department of Health and Human Services Assistant Secretary for Global Affairs Ambassador Jimmy Kolker. Panelists included Commissioner Peggy Hamburg, Foreign Secretary of the National Academy of Medicine and AAAS President; Commissioner Steve Davis, President and CEO of PATH; Scott Dowell, Deputy Director for Surveillance and Epidemiology at the Bill & Melinda Gates Foundation; Beth Bell, Clinical Professor in the University of Washington Department of Global Health; and Pamela Collins, Professor in the University of Washington Departments of Global Health and Psychiatry and Behavioral Sciences. The event was held in collaboration with the University of Washington Department of Global Health, PATH, the Washington Global Health Alliance, and the Bill & Melinda Gates Foundation. Video of the event can be found here. Tuberculosis (TB) is the number one infectious disease killer. Yet, pediatric TB is often overlooked as an urgent public health threat, especially in lower- and middle-income countries. In this episode of Take as Directed, Deputy Director and Senior Fellow Sara Allinder speaks with Dr. Farhana Amanullah, a seasoned clinician and expert in pediatric tuberculosis who runs the largest, private-sector TB program for children in Pakistan at the Indus Hospital Karachi. Dr. Amanullah describes the challenges in diagnosing and treating TB in children and adolescents and shares her expectations for the UN High Level Meeting on Ending TB, which is to take place later this month. This July, top policymakers, scientists, and activists gathered in Amsterdam for the 22nd International AIDS Conference to examine the current state of global HIV/AIDS response, and how that response should be shaped by the global health community in the years to come. In this episode of Take as Directed, I am joined by Owen Ryan, Executive Director of the International AIDS Society (IAS), which organizes the biannual conference. Owen discusses the main science and policy takeaways from this year’s conference and addresses the concerns raised by activists about holding the 2020 conference in San Francisco and Oakland. This episode also includes portions of a speech from Rep. Barbara Lee (D-CA), which she delivered at this year’s conference in Amsterdam. Since committing to support polio eradication on its 100th anniversary, Rotary International has contributed $1.8 billion to the cause, along with thousands of volunteers, advocacy work, and political leadership. Serving as Rotary’s PolioPlus Committee Chair, Mike McGovern leverages the organization’s unique position as an expansive service network to complement the technical expertise of its partners in the Global Polio Eradication Initiative. 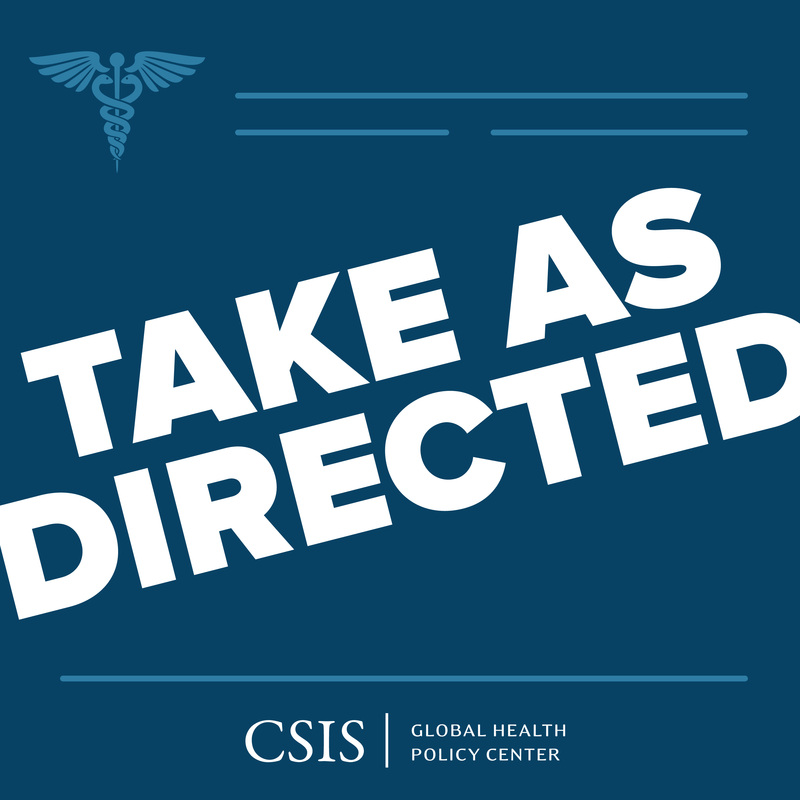 McGovern joins Senior Fellow Nellie Bristol in this episode of Take as Directed to discuss lessons learned from Rotary’s long engagement with the initiative, strategies to sustain eventual eradication while strengthening global health capacity, and next steps for Rotary’s involvement in international public health. The theme of this year’s Atlanta Summit on Global Health is “Health Resilience & Natural Disasters”, which will focus on the public health effects of climate change. Dr. Anne Schuchat, Principal Deputy Director of the Centers for Disease Control and Prevention, will deliver the opening address. I will chair a session on the health impacts of Hurricane Maria in Puerto Rico, which will feature Dr. Carlos Santos-Burgoa of George Washington University, lead author of the report "Ascertainment of the Estimated Excess Mortality from Hurricane María in Puerto Rico". Tickets can be purchased here. In a private session on October 2nd, members of the CSIS Commission on Strengthening America’s Health Security will reconvene for the first time since the Commission launch in April. We will review the work done over the past six months, look ahead to new work streams, and launch the new CSIS microsite for the Commission. The CSIS Global Health Policy Center and CSIS Global Food Security Project will co-host a public event to discuss U.S. government nutrition investments as foundational to broader health and development goals and launch a new report on U.S. investments in Uganda. The report is based on the research conducted by GHPC Deputy Director and Senior Fellow Sara Allinder and Reid Hamel, Senior Fellow in the Global Food Security Project, during their trip to Uganda in April. Registration details to follow. Michaela Simoneau joined us in August as a Program Coordinator and Research Assistant and will primarily support our polio, immunizations, and nutrition portfolios. Prior to joining CSIS, she worked as an intern on projects ranging from infectious disease to human rights, and managed her university chapter of GlobeMed, a global health organization partnered with a grassroots NGO in Tamil Nadu, India. Michaela holds a Bachelor of Science in Biology and International Studies from Boston College. Michaela replaces Isra Hussain who departed for a Fulbright fellowship. Alex Bush, who supported our HIV portfolio as Program Manager and Research Associate, also departed in August for a Presidential Management Fellowship. Stay up to date on all of our events by visiting the Global Health Policy Center program page.